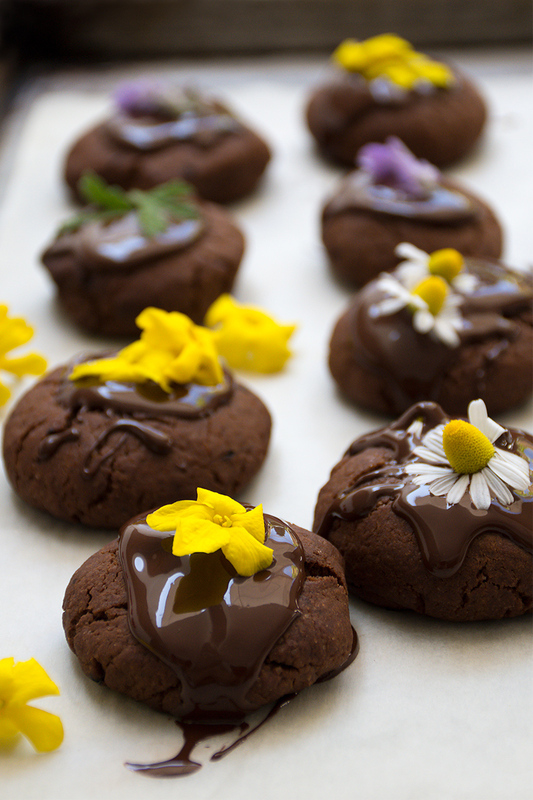 Vegan Chocolate Cookies With Edible Flowers: perfect for a Spring party! 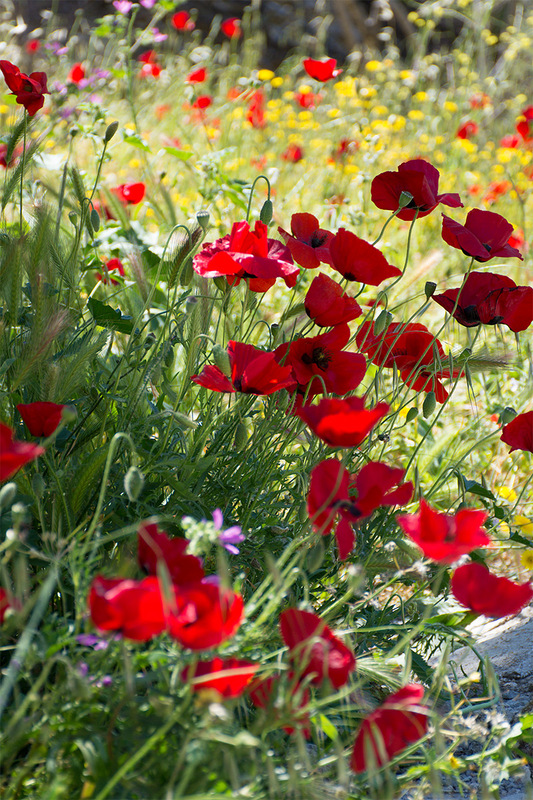 Spring in Greece is an experience not to be missed. One of the wonderful things about it are the beautiful wild flowers and herbs that grow abundantly. It starts in March with the yellow jasmine. 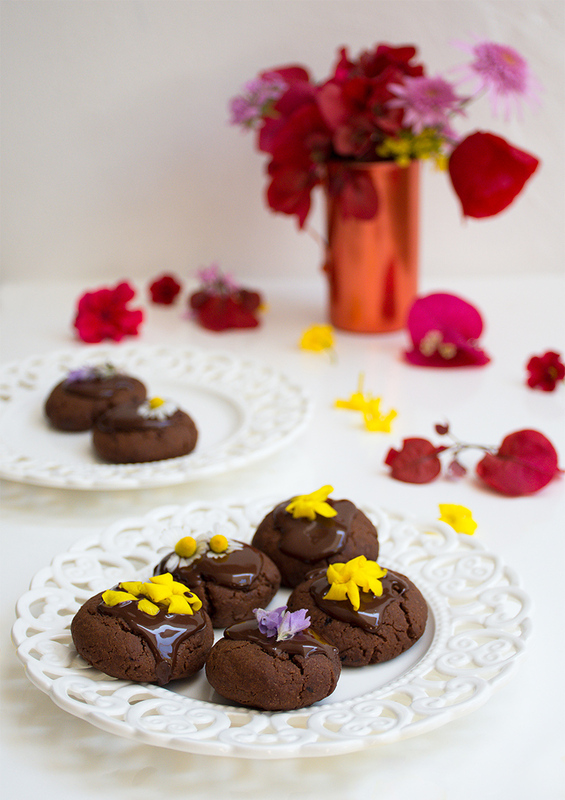 All these amazing flowers are an inspiration for today’s recipe: Vegan Chocolate Cookies With Edible Flowers. A delicious, colourful and happy vegan recipe! Although everyone has the summer icons of abundant sun, blue skies and a warm sea in their minds, Spring in Greece – especially on Poros – is equally nice if not nicer. 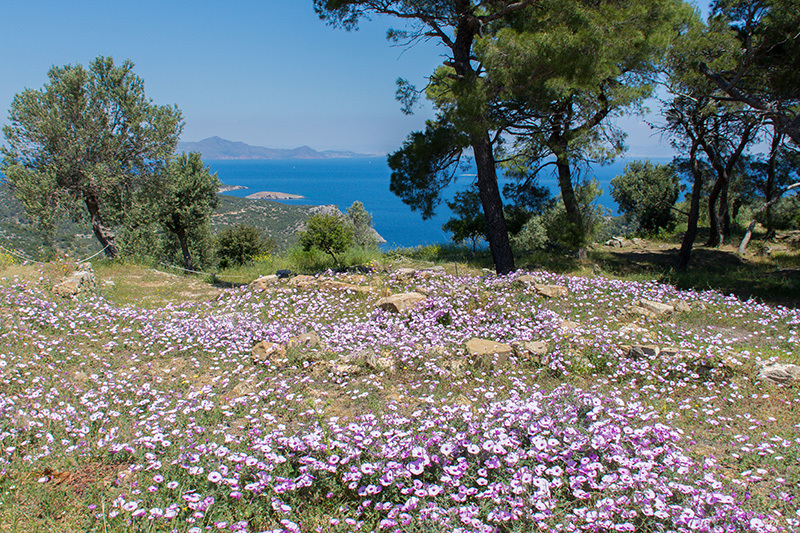 The weather on Poros in Spring is mostly sunny with enjoyable temperatures, while nature is already in full bloom. The weather is perfect for outdoor sports and activities. We often take long walks in the pine forest or along the coast. 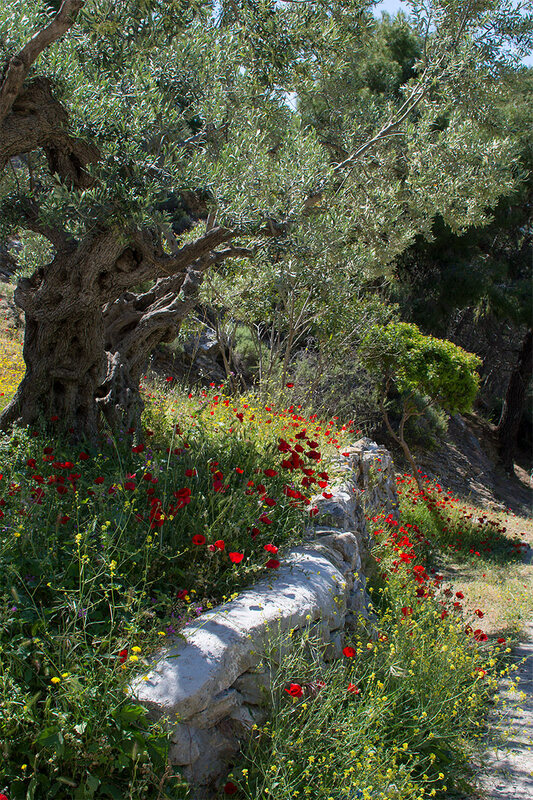 Greek Mythology speaks of Persephone (the mythical goddess of vegetation) giving us the wonderful flowers in Spring. Persephone is the daughter of Zeus and Demeter and the queen of the underworld in Greek mythology. Homer describes her as the “formidable, venerable majestic princess of the underworld”. She has endowed Greece more than 5,600 plant species, of which 750 are unique to the Greek land. Persephone was married to Hades, the God of the underworld. The myth of her abduction by Hades from her mother Demeter (Hades took her to the underworld), represents her status as the personification of vegetation. In the end her mother managed to have her daughter for half a year in our world, where her appearance in spring makes nature happy and blossoming. 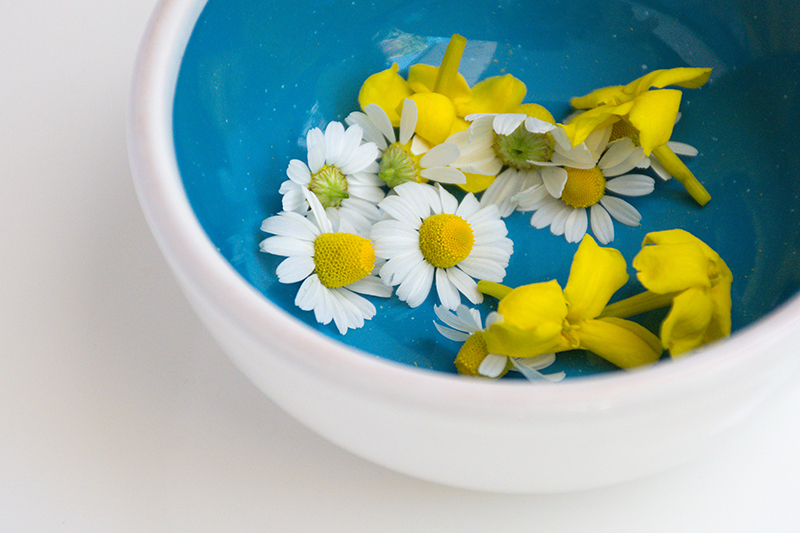 The Greeks were already using flowers in their food thousands of years ago. There are so many great options, like citrus blossoms, dill flowers, lemon verbena, mint flowers and rose petals. You have to be creative! 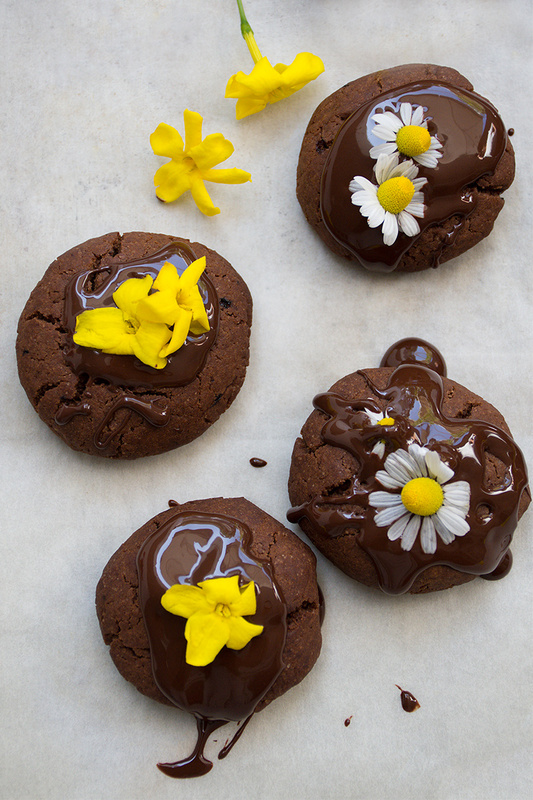 For our vegan chocolate cookies with edible flowers we used yellow jasmin, lavender and chamomile. 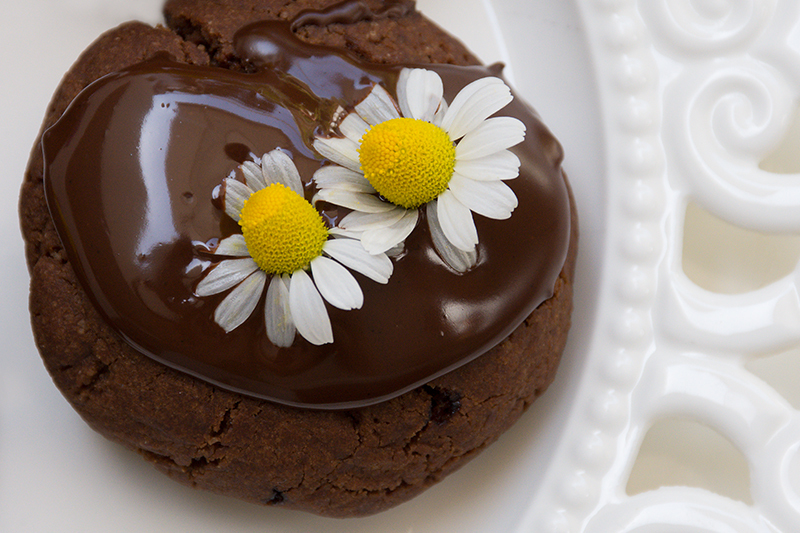 Persephone, Spring, and flowers are not the only inspiration for these fantastic vegan chocolate cookies. A nice family with 2 beautiful daughters that stayed at Odyssey and loved vegan recipes, also added to the creation of this recipe. They all loved these cookies, not only for their looks but also for their taste. They would vanish the contents of a freshly filled cookie jar in no time! 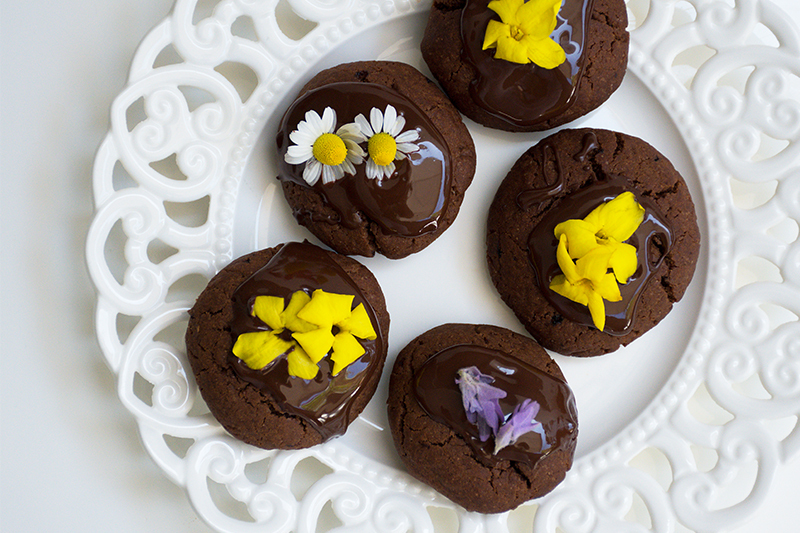 I hope I have convinced you to make my vegan chocolate cookies with edible flowers. I personally find them so easy to make. Not only do they taste very delicious, they are so visually attractive!! Mix the olive oil and sugar until the mixture is light and fluffy. Mix the all-purpose flower, baking powder, salt, cocoa, vanilla extract and the chocolate pasta and add this to the oil mixture. Kneed the mixture with your hands until you get a homogenous mass. Refrigerate the dough for 30 minutes to an hour. Grease a cookie sheet thoroughly. Take the dough from the refrigerator and make 24-30 balls. Place the balls on the baking sheet and flatten them just a little bit. Put the vegan cookies in the oven and bake them for approximately 10 minutes. Allow the cookies to cool for 10 minutes on the baking sheet before spreading the chocolate paste on top of each cookie. Finally, decorate the cookies with the edible flowers for the crowning touch!